The other day, whilst thumbing through a glossy magazine, I came across an article on curry leaves and the history of the spice. Things like that completely stop me in my tracks, and I forgot I was actually standing in line in the store until a testy elderly lady in hot pink rhinestone embellished sweatpants angrily harped that it was my turn! She wore a matching jacket with the likeness of some Las Vegas idol sprawled across her chest, smiling broadly & winking as if though to say he scored himself a lucrative senior sweatshirt deal and was now kicking it with ‘Betty Boo’ here. With a twinge of mild irritation in her crackling, nicotine-damaged voice, she motioned towards the rapidly emptying conveyer belt and proceeded with giving me the stink eye for slowing her & Mr. Vegas down by 5 extra minutes. I snapped out of my curry leaves dream and apologetically resumed proper grocery store etiquette. Because of the drama surrounding ‘the incident with the blue-haired coiffure’, I couldn’t tell you what I read anymore, other than that curry is way old and super versatile. Curry has got to be one of my favorite spices. 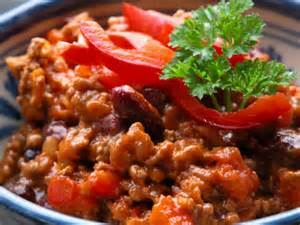 It’s so warm and earthy, you can find it in a variety of heat levels and it colors your food a pleasing, happy yellow. With our family’s poor man’s budget encouraging creative thinking, I picked up a 12-pack of chicken drumsticks and a few random items, and inadvertently came up with the deliciousness below… I hope you enjoy these too. In a large container, pour all ingredients together other than the chicken & cilantro, and stir until well combined. Rinse and pat chicken dry, and let marinate in the curried coconut milk mixture for at least 1-2 hours. Preheat oven to 425F. Take drumsticks out of the marinade and place on a foil-lined baking sheet. Roast for approx. 30-45 minutes, until chicken is crispy and cooked through. Serve with these lovely honey & lime roasted carrots, and rice. Provençe is where the good life is at… It seems time has come to a standstill in the sleepy cobblestone towns, with their red clay rooftops spread out against a backdrop of olive groves and lavender fields, and their historic architecture splayed over the hillsides. These are the kind of rural hamlets where senior villagers frequently lounge in comfortable chairs right outside the doorstep of their old stone houses, to catch up on local gossip and to gawk amusedly at the occasional accidental tourist that stumbles into town. I suppose the younger generation flees towards the excitement & lure of the larger cities as soon as they have the chance, and who can blame them? With nothing more than an old mossy church, a few cafés or bistros and a handful of ‘odds & ends’ type stores the size of shoebox, there’s hardly anything present to engage or capture the essence of youth in these old havens of peaceful nothingness. Chop onion in half, and then each half cross-wise in half again, slice each onion quarter in small rings. Juice 2 of the lemons and reserve both juice and peels. Quarter 3 lemons (including the juiced ones), and then slice each lemon wedge cross-wise in half again. Slice 1 lemon in pretty round slices, for visual appeal… Wash chicken legs and pat dry, then salt & pepper them liberally. In a large Dutch oven, sauté the onions in a splash of olive oil until translucent and slightly browned. Add chicken legs skin side down and brown to a crisp. Add reserved lemon juice, all lemon wedges & slices, garlic, olives, chicken stock & saffron, and braise covered over low heat for approx. 60 min, until chicken is “fall-off-the-bone” tender and flavors have developed. 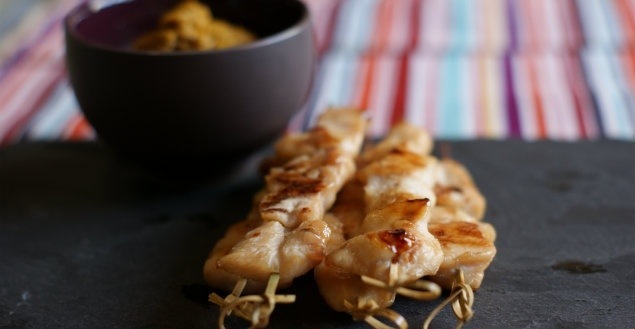 Serve with crusty French bread to sop up the delicious lemony sauce and a crisp, cold Pinot Gris. No. This isn’t a typo. I literally do mean 40 cloves of garlic. I encourage you to fight the good fight for as long as you can, because once your taste buds cross over to the garlicky side, there is no turning back. ‘Allium Sativum’, or common garlic, and I have been going steady since my childhood. Because of our Mediterranean seaside vacations in the South of France, where – let’s face it – people practically take garlic baths, we were exposed to garlicky deliciousness from a very young age. I remember being handed a fresh clove of garlic to rub on toasted, crusty French bread from as early as I had the fine motor skills to do so. It is no wonder that when mom produced this miracle poultry on our dinner table one time, we all succumbed to its culinary super powers and it instantly became a staple in our family’s food pyramid. As children, we’d get excited and bickered over who got to crack the dough seal off of the pot. And as adults, we loved the aroma that caressed our nostrils as soon as the lid came off. I’m warning you right now, that this is by far the juiciest and most flavorful chicken you’ll ever put in your mouth, so unless you’re willing to cook this on a regular basis, don’t do it. Preheat oven to 350F. Rinse the chicken and pat dry, then salt & pepper the cavity. Take roughly about ¾ of all the fresh herbs, and stuff them in the cavity together with the fresh lemon. Rub salt & pepper on the outside and under the skin, and rub the chicken with a bit of butter. Smash the bulbs of garlic on your counter top, and separate all the cloves. Remove the loose, rough outer leaves, but leave each clove in its own peel. Chop the remainder of the fresh herbs finely. In a heavy large oven-proof & lidded pot (such as a Dutch oven), add the olive oil, fresh herbs and 40 cloves of garlic all at once, and stir/sauté for just a minute or two. Place chicken on top of the garlic & herbs. Make a flexible yet firm dough from the flour, water & oil. Roll into a sausage and line it alongside the edge of your pot. Place the lid on top and gently press it down into the dough, creating a glue-effect. The idea is to seal the pot completely, so no air can escape whilst cooking… trapping all the flavors inside. Place the pot in the middle of the oven, and cook for approx. 1 ½ to 2 hours, depending on the size of the chicken. 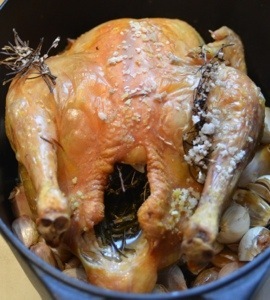 For crispy skin, remove lid from pot (you’ll have to crack it open!) for the last ½ hour of cooking so the skin can brown a bit, however, doing so will allow all the delicious flavors to escape and mellow out a bit… I’m not a chicken-skin aficionado, so I usually don’t care about crispy skin and leave my pot closed. This will be your call, really. 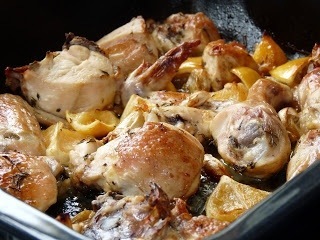 When the chicken is done, take it out of the pot and scoop up the cloves of garlic that have now browned and caramelized in the chicken juices. You can quite literally squeeze them out of their peel, and use the sweet, caramelized flesh to mix into mashed potatoes or schmear directly on crusty slices of French bread. Bon appétit! Serve with any vegetable you like, but ‘Confit Byaldi’ is a great accompaniment.